In 2011, award-winning independent filmmaker Jay Craven and Kingdom County Productions founded a semester-long film intensive at Marlboro College called Movies from Marlboro. Since then, this pioneering program has provided invaluable experience to 96 students from 23 colleges and universities around the world. In addition, the program produced three independent films, featuring award-winning actors, that have played internationally in theaters, festivals, and alternate venues—and on Netflix, Amazon, ITunes, Showtime, and more. Now, this innovative and experiential film program has taken up residence at Sarah Lawrence College, where it is directed by Craven and SLC film chair Fred Strype. Cinema Sarah Lawrence, backed by the resources of the College and its robust Filmmaking & Moving Image Arts program, will build on and further strengthen this semester-long immersive hands-on experience that is unique and unparalleled in the United States. Cinema Sarah Lawrence draws inspiration from education pioneer John Dewey’s call for intensive learning that “enlarges meaning through shared experience and joint action.” By owning a substantial piece of the overall production, students learn vital skills in collaboration, problem solving, critical thinking, flexibility, and more. "If you had told me this past summer that I would be spending spring semester of my sophomore year in Vermont working on a period film, I wouldn’t have believed you. If you had told me how involved and respected I would be as a student, and that I would ultimately be given the position of Second Assistant Director on set, there is absolutely no way I would have believed you. The satisfaction gained from knowing you helped create something larger than yourself is truly invaluable, and I am very grateful for the experience. Thank you!" "Thank you so much for this opportunity. For as long as I can remember, after firefighters and astronauts, I wanted to be a film director. This experience has helped me see into that world, and expose me to the reality of its depth. I could never have imagined the intricacy of relationships not only on the crew but with the entire cast and public. Furthermore, it was inspiring to see so many students and members of the community come together under the direction of an assembly of caring and trusting professionals. I cannot thank you enough for this experience." "I would do this again in a heartbeat. My learning experience was phenomenal. I felt I was constantly learning -- set etiquette, how to communicate with an actor to get the performance you desire, how a film cuts together and how the crew interacts with each other to make the film. This project was an incredibly unique experience -- not only to learn the practical aspects of a film set and filmmaking but also to understand how difficult producing independent film when you are facing constraints day in and day out. The only thing I would recommend as a general note is that students applying to the program really should be aware that they have to be at the top of their game from the get-go. Putting their best foot forward. "I would just like to end on the following note. I think this program would have been nothing, NOTHING, without the great group of students we had working together but I also think it would have been less than nothing if we did not have the group of professional mentors that we had on the project. I hope to continue working in film and all I can say is that everyone from now on will be compared to the crew we had on this film because it was a group of individuals who really committed and believed in the practical learning and teaching aspects of film. These people really made the experience so unforgettable and so valuable to all students. Thank you!" "This experience went far beyond all of my expectations and I think it is one of the best experiences of my life. A normal semester at school has its own value in terms of understanding the theory behind filmmaking whereas this semester for me was about learning how to navigate my way around making an actual and ambitious film production. Now when I go back to school my experience will be even more valuable for having had this opportunity. I think I liked my time as Script Supervisor the most. Despite being the most difficult job I had, it was very rewarding. I would totally do this program if given another chance. And I would highly recommend this for anyone who has any interest in film." Writers for Recovery provides writing workshops, staff trainings, public readings, and talks to recovery groups, residential treatment facilities, and recovery organizations. KCP writing mentors help people discover the power of the written word to process trauma, build self-esteem, and support healthy, sustained recovery. 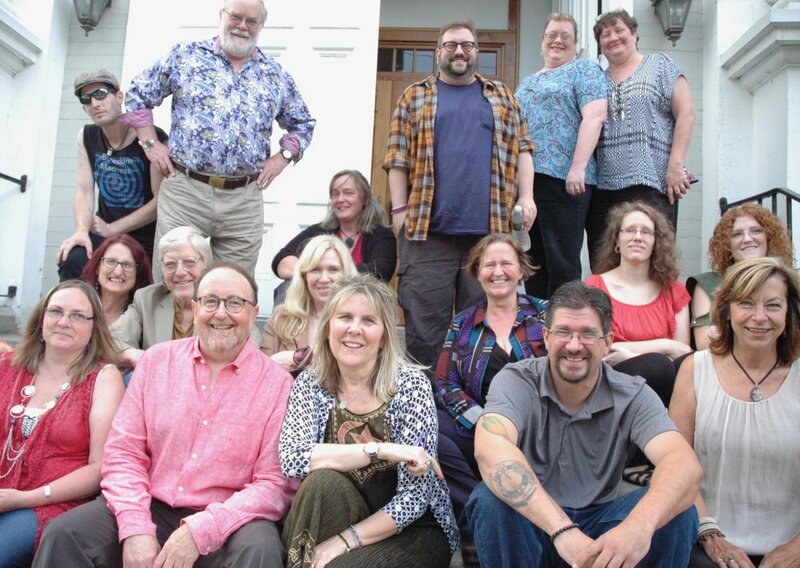 Since 2014, Writers for Recovery has worked in communities from Newport in the Northeast Kingdom to Brattleboro on Vermont’s southern border. We’ve held workshops in correctional facilities and recovery centers. We’ve staged readings in libraries, gallery spaces, and the Vermont State House. We’ve given talks to recovery professionals, educators, and community leaders. And we’ve shared our message in newspapers, TV, radio, and online. Our work has helped people across Vermont gain new perspectives on addiction and recovery. And it’s helped reduce the stigma of addiction by showing that people in recovery can make valuable contributions to their communities and lead rich, fulfilling lives. "It felt special to have a place to be and commune, socialize, LEARN, to open my mind and heart and reveal my true self without fear." "If it wasn't for this class, I don't know if I would have reached out for help"
"I can tell things to you I can't tell my therapist." A few months ago a good friend of mine died of a heroin overdose. He was a good kid—too young to die, too stubborn to live. Today I saw a woman passed out on the sidewalk. Two firemen stood peeling her off the pavement. One woman stood by, watching the firemen work. Who was this woman? A few months ago a good friend of mine died of a heroin overdose. He had just gotten home. Back from the road. I saw him at the bus stop before I boarded a bus to Montreal for my cousin’s wedding. He was gonna stay with me for a bit when I got back to Rutland, VT. No using drugs when you’re with me this time around, I said. (He stayed with me before he had left.) I mean it, I scolded. Okay, he told me. Okay, I won’t. A few months ago a good friend of mine died of a heroin overdose. He was a good kid—too young to die, too stubborn to live…. In the 2003 nearly 1000 teens from across Vermont participated over two years in creating THE VOICES PROJECT—an original musical based on the lives of Vermont teens. Through extensive conversations, interviews, and writing workshops with Vermont youth, stories were culminated, a script written and music composed by youth for the groundbreaking musical that took Vermont by storm. Vermont teens were cast in the live musical that toured across Vermont in 2005. The play was highly acclaimed and praised for it’s honesty and powerful portrayal of high school youth. The play was featured in the New York Times and was praised by Scholastic Magazine. SHOUT IT OUT—The film version of THE VOICES PROJECT was produced in 2008 and won the 2010 National Education Association (NEA) Human and Civil Rights Award for empowering youth voice. SHOUT IT OUT and its accompanying study guide are used in high schools across the United States for in-depth discussions around teen issues.